Now you can get your supplies here! Designing applique patterns and teaching my time-saving applique techniques have become a major part of my life. There are many applique techniques, and all of my designs can be easily converted to use the method of your choice. Needle-turn applique technique is my preference because it is so forgiving. The needle is used to to turn the edges under so there is very little "prep work" involved. The results is a soft rolled edge that gives a wonderful dimension to your finished project. Please contact me for information about visiting your Guild for a trunk show and personalized workshop. 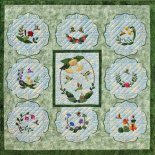 The web shopping pages offer applique patterns, kits, block of the month kits and notions. My hope is that each pattern gives you inspiration and enjoyment. is all about this amazing little bird. Although tiny in size, this colorful bird is mighty! Use your favorite method of applique to create this charming quilt. 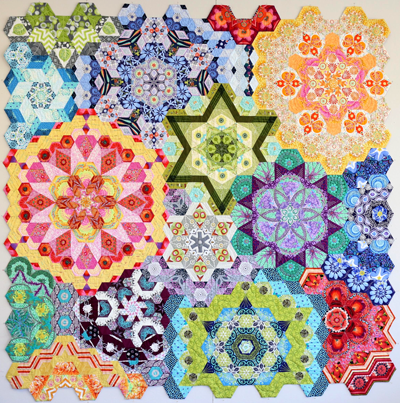 Hummingbird Haven is offered as individual patterns, or as a kit of the month. 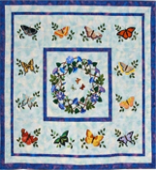 features delicate butterflies dancing around morning glories. Butterflies are so charming and are admired all over the world. The instructions give a brief history of the butterflies and their habitat.